The west coast of North Brittany from Ouessant down to the Raz de Sein. Scale: 1 : 77,300. One-minute gridlines. 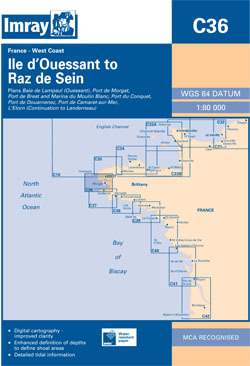 Larger scale plans of Le Conquet, Port de Brest, Morgat, Camaret-sur-mer, Douarnenez, Baie de lampaul(Ouessant), Marina du Moulin Blanc, Brest. Tidal stream diagrams. For this 2015 edition the chart has been fully checked and updated throughout.